First, note that I don't actually know the product model year. There's not very much to find about this model online. Functionally, this subwoofer is a bit lacking. The speaker pass-through has no high pass circuitry, so it's only a convenience if your amplifier doesn't have more than two speaker outputs. I plugged in one of my speakers through the passthrough (a pair of Klipsch Synergy B-10 monitors) and was able to play a 20hz tone to it no problem, so that's certainly the case. The low-pass is also a bit high-reaching. It only turns down to 80, and the gradual slope means a lot of higher frequencies still come from the sub. It bottoms out around 40hz or so, so this is probably for the better. The auto power-off is nice, but I only use it as a precaution in case I forget to turn it off. I turn it off myself to save energy, since it waits a bit of a while (maybe 15 minutes or so) to turn off on its own. Even still, I'm quite happy using this for music and games at my computer. I have it set up in a small, square-shaped room (one wall is slightly longer, but it's almost entirely a square) with the driver pointed in the corner. It's right in the middle of my two speakers, and right in front of my knees when in use. For this application, it has plenty of power and meshes well with my tiny speakers; they bottom around 60hz, so the sub plays in with them nicely. It's definitely bass-you-can-feel in this setting! It's also definitely only for bookshelf speakers. My Klipsch floorstanders (Synergy F-20) play lower and stronger into the bass frequencies than this does, so it wouldn't only not play well, it would sound very unnatural. As mentioned, I got this for $50 at a pawn shop, and for that, I've been very happy with it. The vinyl wrapping on the front baffle is peeling off (came that way), which obviously imposes no functional problems. With mine pointed into the corner, I don't even see it! I don't know how the last owner (or owners) used it, but it's in perfect functional order as I use it now. Overall, very successful budget sub. Started to distort after two weeks, then smelled like burnt electric stuff. Put it out in the garage in fear of a fire. I hope they discontinued this product which failed after 2 weeks of serice. Placed it in the garage and bought a Velodyne which has been fine. Would like to have this thing working so I can use it in the garage when working on my car. Velodyne 10", beautiful and has been working for years. Very good looking, high quality materials, magnetic shielded, small size. Poor quality sound, don't reach lower than 40 hz (hasn't deep bass extrange subwoofer) i really called woofer only because the sub frequencyes aren't reproduced. I really don't recomend it. Well i've reviewed before about this product, and yesterday changed the psw-202 to a Monitor Audio ASW-100. Te reason, is simpe, the psw-202 is good made, good quality materials and looks fine, but the sound is a desaster. I don't like it, because is the only sub that reaches to 40 hz, and doesn't have deep bass. And the upper frequencyes interacts whit the main speakers and make the finaly sound very rare. I don't like polk products so much, are ver well made, but the sound doesn't have sense, doesn't have emotion. I really prefer Monitor Audio products. If you want to listen a decent bass the sub that you buy have to reach 35 to 30 hz allmost, if goes down to 25 or 20 hz is better. 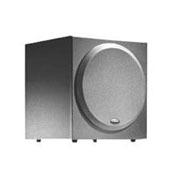 No one, because it is the only active subwoofer that reaches as lower frequencyes 40 hz. economic, very good cuality construction, heavy, very complete for the price, good cuality sound, 10 inches woofer. Doesn't have LFE input, it could be a little louder, but it's ok. It's an economic but good subwoofer, ideal to use in bedrooms for it's dimensions. Is no very loud, but I have a pair of Monitor Audio Bronze B2, and this sub reproduces the lower octaves very well.I'm very happy with it. Oviously there are a lot of better subs, but their prices are very high, specially in Argentina where the electronics is something very expensive. I set the crossover switch at 9 o'clock, the phase at 0 degres and the volume knob at 12 o'clock, and it sounds deep, powerfull and clear. Clarity, purity, and definition are unmatched for under $1500.00. It is NOT heavy handed. Excellent overall construction and good looks. Fast response and no "overhang". Enclosure is acoustically dead and has no audible resonance. A better voice than the PSW404 for much less money. The cleanest 10" sub I demoed. Typical Polk quality. No binding post. Clips hard at very high volume. Cannot fill-out a large room by itself. Cannot reach lower registers. Amplifier has no heat-sink and has reliability problems at high volume. None. It is in a league of its own. Good solid little unit, lots of low bass. Nice unit for little money. Can't find any yet. I'm sure a $600 Velodyne would beat it, though. Good Sub for the money, used in a small room(20x15). Compliments my other speakers and seems to have enough adjustability to accomodate many systems. Don't know if they would work in a larger room, but for the money spent I can't complain. Minnesota Audio Labs 6550 power amps, YS Audio Tube Preamp, Sota Sapphire. Linaeum LT1000 main speakers. Musical Fidelity CD player. because so many have had their amplifier section fail, there must be a fundamental design flaw in the amp. two units purchased brand new and both have dead amplifier sections after minimal usage. if you go to the polk forum website, you'll see that others have this exact same problem (constant buzz and then no audio). you can (and i have) take the amp section out, mail (at your own expense) amp section to polk and they will fix/replace - but it is not acceptable for both these units to have failed with very minimal audio usage. not sure what else I cove gotten for the $ but theres got to be something better than this. great sound for music, but not at all for bass-heads like myself,although it will soon have the opportuity to redeem itself when I get the chance to turn the volume up and see how it sounds,for its sake I wish it luck. Price. Sounds great. Looks great. Nice build quality. Crossover and volume knobs on the back - when will manufacturers get a clue it's inconvenient! I have got my previous Yamaha sub just because the knobs are in front. Does not have spikes for the carpet. Front-firing woofer is covered by cloth... And I am afraid of damaging it when vacuuming the room. The subwoofer was the cheapest one Fry's had at the moment (it was on sale - normally they sell it for $199). I have compared it to PSW-303 they also had in stock, but could not see any tremendous difference that would justify paying $299 for it - even in their huge demo room. Paired with Polk RTi28's and an Onkyo TX-8211 receiver, it makes a perfect combination in my small living room/study (I live in an apartment). I have measured sound spectra with Signalscope/Signalsuite through the internal microphone on my Powerbook, and the response curve of the whole setup looks essentially flat down to about 35Hz. The bass subwoofer outputs is not boomy and is not tiring on my ears. It just supplements the main speakers enough to make them sound just right (of course, I had to fiddle with crossover and volume settings quite a bit). The sub looks nice and solid with a big woofer in front and wood-textured sides. It looks even better with the front cloth cover removed. The particular sub I got is made in China, but the build is of high quality, and has a 5 year warranty (3 years for the amplifier part). Good defined low bass sound. None that is disturbing, except a little distortion at near max volume, which is really not necessary for most listening pleasure ! Just hooked up the PSW202. Sounds great with the Yamaha RX V440. Gives a defined BOOM when needed. However, it sounds a little distorted at high volume. Otherwise, it is good value for money. This thing sure gives more than its size !